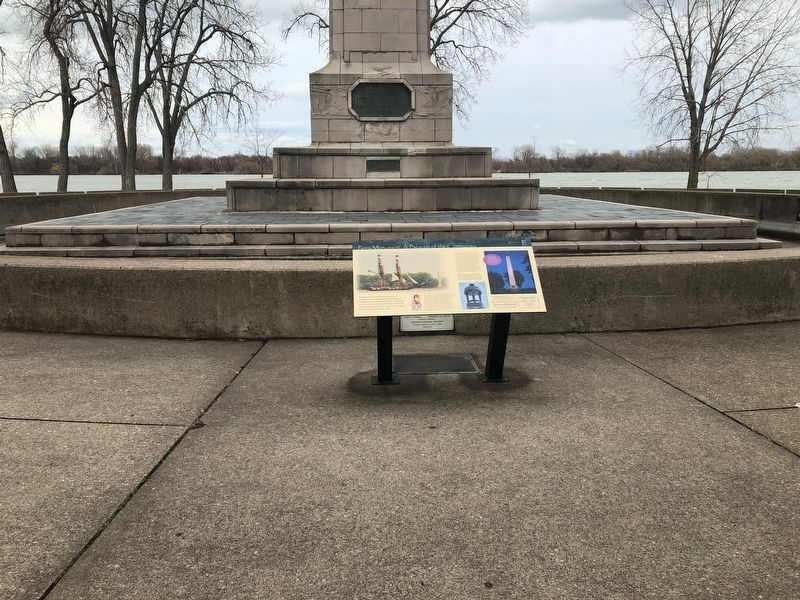 Perry Monument commemorates the victory of Commodore Oliver Hazard Perry over the British in the Battle of Lake Erie on September 10, 1813. Erected by the Continental Construction Company of Erie and dedicated September 10, 1926, the monument quickly became a beacon of community pride. 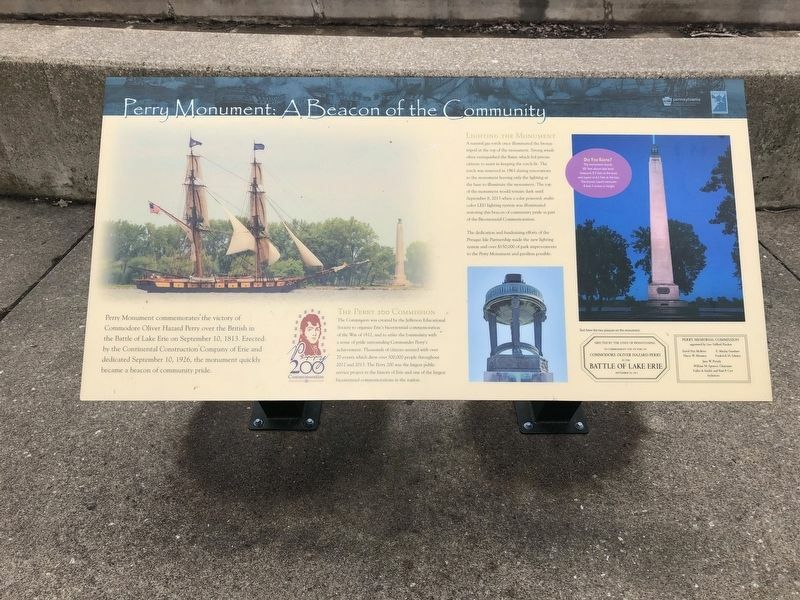 The Commission was created by the Jefferson Educational Society to organize Erie's bicentennial commemoration of the War of 1812, and to unite the community with a sense of pride surrounding Commander Perry's achievement. Thousands of citizens assisted with over 70 events which drew over 500,000 people throughout 2012 and 2013. The Perry 200 was the largest public service project in the history of Erie and one of the largest bicentennial commemorations in the nation. A natural gas torch once illuminated the bronze tripod at the top of the monument. Strong winds often extinguished the flame which led private citizens to assist in keeping the torch lit. The torch was removed in 1963 during renovations to the monument leaving only the lighting at the base to illuminate the monument. The top of the monument would remain dark until September 8, 2013 when a solar powered, multi-color LED lighting system was illuminated restoring this beacon of community pride as part of the Bicentennial Commemoration. The dedication and fundraising efforts of the Presque Isle Partnership made the new lighting system and over $150,000 of park improvements to the Perry Monument and pavilion possible. The monument stands 101 feet above lake level, measured 8.5 feet at the base and tapers to 6.5 feet at the top. The bronze tripod measures 8 feet 3 inches in height. Location. 42° 9.3′ N, 80° 5.375′ W. Marker is near Erie, Pennsylvania, in Erie County. Marker can be reached from Thompson Drive north of Fisher Drive, on the right when traveling north. Touch for map. Marker is in this post office area: Erie PA 16507, United States of America. Touch for directions. Other nearby markers. At least 8 other markers are within walking distance of this marker. Son of the Sea (a few steps from this marker); Tribute to a Hero (a few steps from this marker); Commodore Oliver Hazard Perry Monument (a few steps from this marker); From the Bay to the Battle (within shouting distance of this marker); And the Misery begins... (within shouting distance of this marker); Erie's Industrial Explosion (within shouting distance of this marker); Fishing on the Sweet Sea (within shouting distance of this marker); Preparing For Battle (about 300 feet away, measured in a direct line). Touch for a list and map of all markers in Erie. More. Search the internet for Perry Monument: A Beacon of the Community. Credits. This page was last revised on April 16, 2019. This page originally submitted on April 16, 2019, by Devry Becker Jones of Washington, District of Columbia. This page has been viewed 34 times since then. Photos: 1, 2. submitted on April 16, 2019, by Devry Becker Jones of Washington, District of Columbia.